This week Brock hosted our third visit from Glynis Wilson Boultbee in the form of a Summer Teaching Institute. The two day workshop focused on creative tools to encourage student engagement. On the afternoon of the second day, we held a one hour “conference” in which every one of the 12 participants were invited to share a piece of non-astounding teaching insight in 5 minutes or less. Participant presentations ranged from areas of deep expertise, Reflective Journalling for example, to areas of exploration, like the use of Pinterest in the higher ed classroom. I was invited to present visual notes but there was something that I am certain could have more impact; something even more non-astounding yet easily translated into a higher ed classroom. 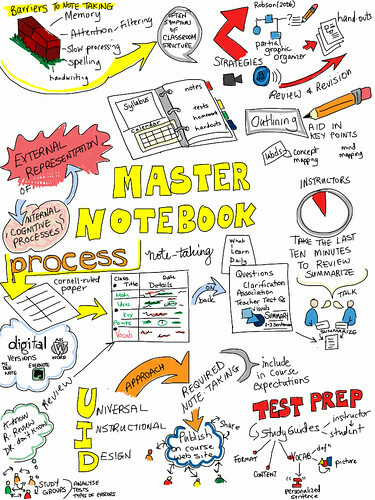 A couple years ago, I went to a 3 day workshop on Universal Instructional Design and we covered the topic of Note-taking. I took these visual notes and although I don’t find them to be my best piece of creative work, they are not particularly clever or original, they actually hold so much information for me about note-taking that I have this as a poster on my wall as I consult faculty. Each drawing and note acts as a memory anchor for me. These notes are extremely effective as a learning device (FOR ME). By showing this drawing, I wanted to show the diversity of possibility in taking notes but also highlight some key facts about note-taking. Note taking is the external representation of internal cognitive processes. Cornell ruled paper is a sheet of lined paper where the margin is at 1/3 of the page. The main notes are taken on the right hand 2/3 of the page. Then the instructor provides the last ten minutes of the lecture to allow the students to turn to their neighbour and scan their notes. In the first 1/3 margin, they note (perhaps in another colour) the main ideas, key points, key words, new vocabulary. In pairs or 3s, students clarify any questions and detail any associations they have with previous learning. If you could draw one picture to represent the main ideas in today’s lecture, what would it look like? Write a 2-3 sentence summary of the learning today. Of course, the note taking could also be done using a myriad of digital tools, blogs, Evernote, even Word. Some instructors have designed their courses and included the sharing of notes into the course expectations. I have seen this done very successfully using colloborative tools like Google Docs or Etherpad. However, the notes are taken, digitally or analogue, the act of discussing and sharing the notes can be a powerful learning opportunity. These notes would be kept and used for review. In groups of 5-6, they could scan through their notes and denote K, NR or DK (K-Know, NR- Need Review, DK- Don’t know). Whenever I share these note taking strategies for instructors, it seems so non-astounding yet it a very small thing that can have a great impact. I did this note from Lee Shulman, “Taking Learning Seriously,” Change 31.4 (1999): 10-17. Shulman’s main conclusion was that there should be more formal structures to look at, review and disseminate good teaching and learning practice. To me, just sharing non-astounding teaching practice is taking learning seriously. THIS is scholarship of teaching and learning: try, reflect, analyze, share.